Retargeting the top left image to wide format, 200% width. The importance map was generated using a gradient filter and refined by a few strokes (top right). The computation of the retargeted image took 4 milliseconds, and the overall process took 30 seconds of user time. We propose the space of axis-aligned deformations as the meaningful space for content-aware image retargeting. Such deformations exclude local rotations, avoiding harmful visual distortions, and they are parameterized in 1D. We show that standard warping energies for image retargeting can be minimized in the space of axis-aligned deformations while guaranteeing that bijectivity constraints are satisfied, leading to high-quality, smooth and robust retargeting results. Thanks to the 1D parameterization, our method only requires solving a small quadratic program, which can be done within a few milliseconds on the CPU with no precomputation overhead. 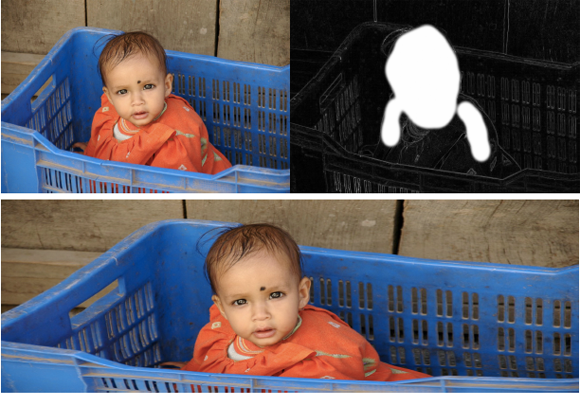 We demonstrate how the image size and the saliency map can be changed in real time with our approach, and present results on various input images, including the RetargetMe benchmark. We compare our results with six other algorithms in a user study to demonstrate that the space of axis-aligned deformations is suitable for the problem at hand. Results comparisons with existing methods on the RetargetMe benchmark. We are grateful to all the volunteer participants of our user study, to Jacob Mattingley for the CVXGEN solver and to Susana Castillo for the support in the generation of the user-study statistics. This work was supported in part by the NSF award IIS-0905502.